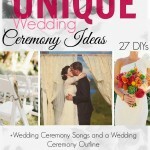 Step 1: First select a font you like, either one from Microsoft Word or a free font website. I can’t remember which one I chose, sorry! Type out the numbers you need in the font you like, scale them so they’re the right size, and print them out. 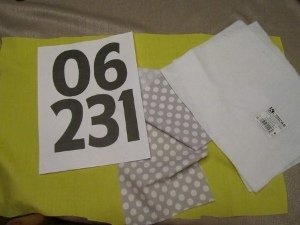 Tip: Print it as a “draft” or with a lower quality to save ink, because you’ll be discarding the printed numbers later–they only serve as a template. 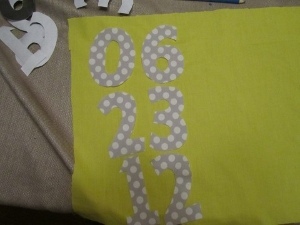 Step 2: Cut out your number templates, lay them flat against your chosen fabric, and cut them out of the fabric. 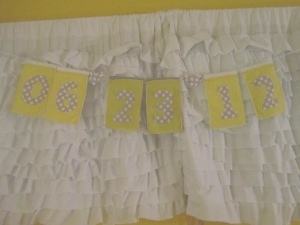 Note: Make sure you lay the numbers face down on the wrong side of the fabric so that they face the correct way when you’re done. 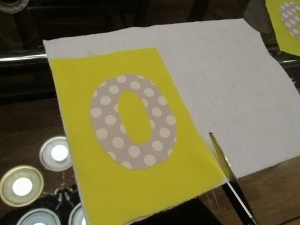 Step 3: Now cut a rectangle to go with each number. I just measured based on the size of my numbers. You can change the size (or shape) of yours. Have fun with it! 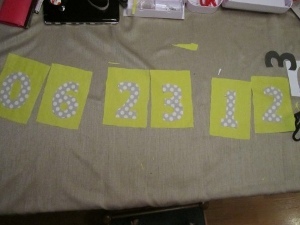 Step 4: Once you have all of your rectangles cut, it’s time to attach the numbers. 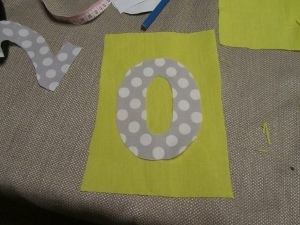 I decided to use Stitch Witchery so I didn’t have to worry about sewing around all those curves. 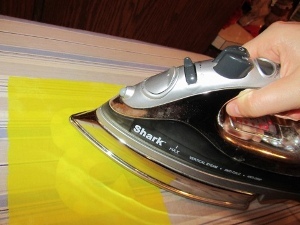 You can learn how to use fusible fabric tape in this post about making a no-sew hem. 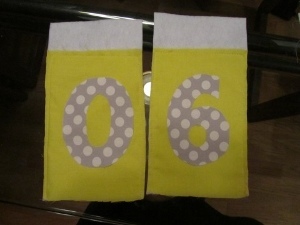 I cut the tape to fit in my numbers, laid the tape on the wrong side of each number, set the yellow rectangle on top, and ironed it on. Step 5: I cut rectangles out of felt that would be attached to the yellow rectangles, just to give the banner some sturdiness. I knew it would be billowing in the breeze, and I wanted it to lie flat in our pics (it ended up billowing much more than I thought it would. If you’re taking your engagement pics by a lake, don’t assume things will billow in the breeze; assume they’ll flail maniacally in the wind gusts). The felt rectangles should be longer than the fabric ones, because you’ll fold the top over to make a loop, which is where you’ll string the ribbon/rope through. 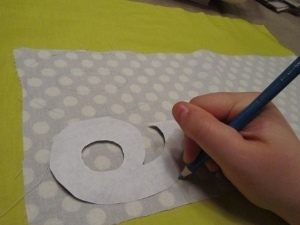 Then sew the fabric to the felt. 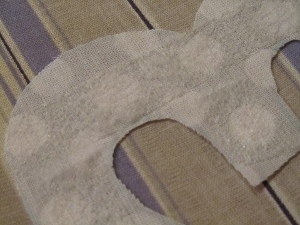 Step 6: Make the loop I just mentioned (it’s more of a tube, really) and sew it down. Then make your spacers. I chose to cut hearts from my fabric and attach them to felt. 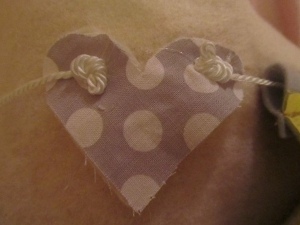 I cut two little holes on the top of the hearts for the string to go through. Once you’re done stringing your rope/ribbon through all of the number loops and spacer holes, you might have to tie knots and/or employ your trusty glue gun and/or give up your first born in order to get the spacers to not bunch up under the weight of the numbers. And here they are in action! Note: Heads have been decapitated to protect the innocent.